The adidas Questar Ride Shoe was designed with the runner in mind. Featuring a lace up fastening, this lightweight, comfy piece is built for lasting style and comfort. Designed with a two-tone, open knit upper, cushioned ankle collar, Ortholite insole and Cloudfoam sole. > Lace fastening. The item may have the odd mark or just dust on which those not affect the quality or purpose of the product. Size: UK 8 | EU 42.2/3. > Sole: Synthetic. > Inner: Textile. Adidas Nmd Boost Men's Trainers UK 9.5 EU 44.Used in good condition. Left shoe has some blue discoloration on white sole. Insoles we changed for new ones there is no original insoles. One pack of insoles will be given for free. Dispatched with Royal Mail 1st Class. 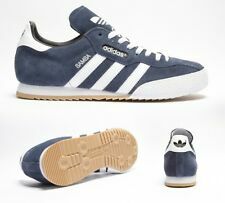 ADIDAS VINTAGE LA TRAINER OG WHITE/ BLACK MENS SHOES. For sale a pair of vintage adidas Rekord Trainers Rare. Condition is Used. Dispatched with Royal Mail 2nd Class.